Agni Yoga is an ancient yoga. But in the early 1900’s it got a renewal. Agni Yoga is the highest of the seven schools of yoga. All of them stem from Patanjali, the great seer-sage who lived millennia ago in India and gave the world The Yoga Sutras. I believe that he either received them from the Ancient Ones from the previous world system or intuited into that vast fount of ageless wisdom and brought forward the comprehensive understanding of form and forces that he did. No matter how Patanjali acquired the revelation, The Yoga Sutras stand today as one of the greatest pieces of human science ever conveyed. Agni Yoga is the final and most refined of those yogic sciences. It is a synthesis of all of the most sublime aspects of the previous six yogas. It also requires that those sublime results be established within the practitioner in order to safely and effective practice Agni Yoga. In the early 1900’s, Nicholas and Helena Roerich brought Agni Yoga to the western world. At that time, the Theosophical Society and its movement were in a ripe phase and the western open-minded person was investigating metaphysics and mysticism through the wide reach of theosophy. Anthroposophy and the trans-himalayan wisdom branched off from that stem around 1925. Yet, due to theosophy, Agni Yoga could find ground. This series will include various ways to get acquainted with Agni Yoga. 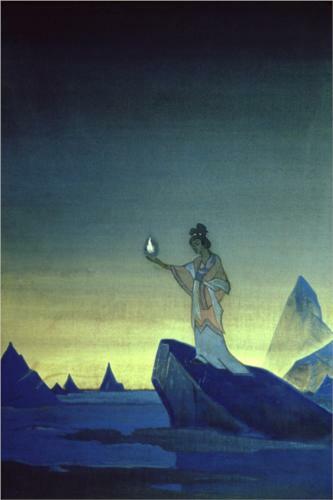 lastly, through the artwork of Nicholas Roerich who was an Agni Yogi. This entry was posted in Agni Yoga, Vajrayana and tagged Agni, agni yoga, Patanjali, Yoga Sutras of Patanjali. Bookmark the permalink.